Streamlining trailer production lead times and preparing for the future, Next Gen Engineering uses Fuwa K-Hitch axle and suspension systems as a standard across its business. Optimising its trailer builds with Fuwa K-Hitch suspension and axle systems, trailer building business, Next Gen Engineering, has grown exponentially since its inception three years ago. Fuwa K-Hitch Regional Sales Manager, Diaa Bishara, says that Fuwa has been supplying the trailer builder with KT250 air suspension systems with 10-stud disc brake axles that are fitted with WABCO Pan 19 brakes for about three years. “Fuwa K-Hitch gear seems to fit in almost seamlessly with our production builds,” John says. 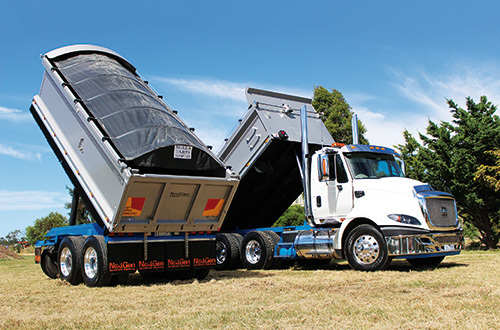 “The performance advantage is something like three-to-four days per trailer, which is phenomenal considering it now takes the company about seven working days to finish a new tipper or dog trailer, as opposed to 10-12 days. With Fuwa K-Hitch providing effective after-sales support, Next Gen Engineering can coordinate better trailer builds. John says that if a trailer build was to enter the axle and suspension stage without having access to the specified parts, it can waste an entire day – protracting the manufacturing lead-time, which makes Next Gen Engineering’s professional relationship with the manufacturer important for maintaining exceptional customer service. Embracing the benefits of trailer building productivity – to benefit commercial transport operators looking for reliable tippers and transport equipment – Next Gen Engineering is working hard to push its capabilities even further. 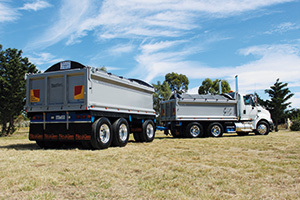 Fast Fact: Since 2014, John Abela, Director and owner of Melbourne-based business, Next Gen Engineering, has narrowed the company’s focus on manufacturing general bodies and tipper equipment. “I decided to specialise because there are a lot of fleets out there looking for tippers at the moment, so much so that we’re actually trying to keep up with the demand for our gear. It’s a good problem to have,” he says – adding that the high demand doesn’t affect his delivery promise.